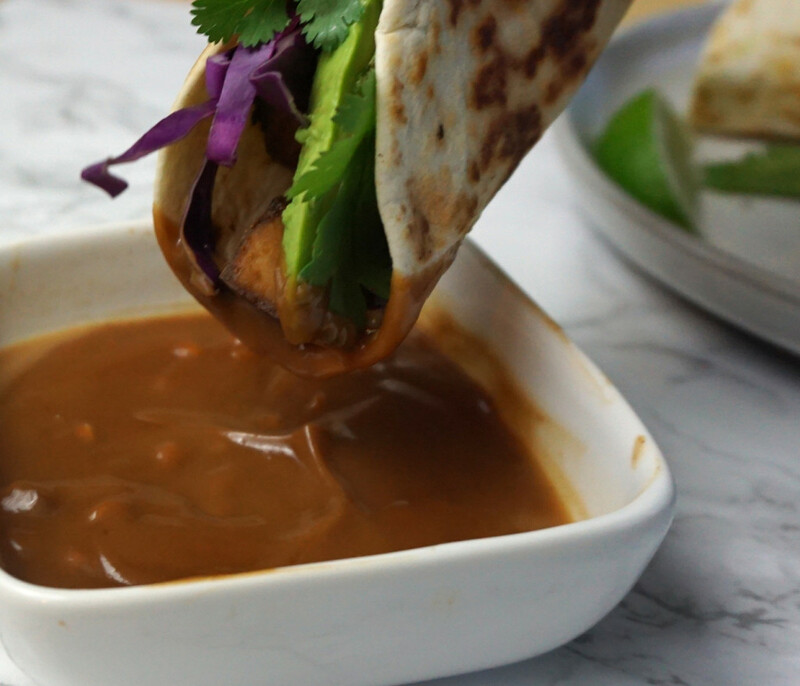 These Asian inspired tacos are meatless, but full of flavor thanks to the marinated tofu, crunchy cabbage creamy avocado, and addicting peanut sauce. If the idea of tofu freaks you out there’s no need to worry – it’s easy to use, super flavorful after being marinated, and pretty fool proof to make! It’s also easier on the wallet than meat and available at pretty much every grocery store. I remember seeing tofu for the first time on Mr. Rogers and I was totally intrigued. My mom got it for us a few months later and fed it to us straight and completely unseasoned. Not. Good. Tofu basically has no flavor on its own, but it absorbs flavors really well, so a marinade is a must. I usually go with an Asian marinade as that’s my favorite profile and it works really well with tofu. The trick with tofu is to soak up the excess liquid before using. It’s packaged in water, so there’s a lot of water soaked up into the spongy tofu. I soak up the excess water with folded paper towels. The tofu should be fairly sturdy, so you can press down to squeeze out the excess liquid. I served this with my favorite peanut sauce recipe. This is the sauce I usually make with spring rolls and it’s soooo yummy and addicting. No guarantees that you won’t eat this straight out of the bowl sans taco. The best part of the recipe is that it’s so freakin’ easy to make. Only three ingredients and one of them is water, so basically only two ingredients. If you wanted to skip the sauce you could and the tacos will still be good(and a bit healthier), but you should totally try the sauce sometime – it’s bomb. Press the tofu between towels to remove excess moisture. Cut into about 1 inch cubes. Add to the sauce and gently toss until thoroughly coated. Cover and place in fridge to marinate for at least 30 minutes. After the marinating time in the fridge, preheat the oven to 350 degrees and line a tray with tin foil and coat with cooking spray. 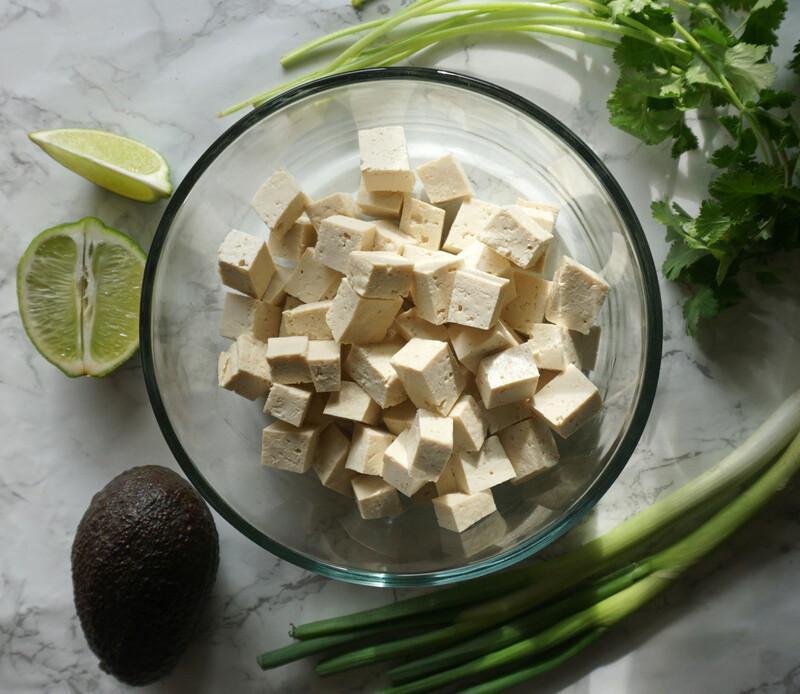 Place the tofu cubes on the tray, with a small separation between each piece. Put into the heated oven. Check on the tofu after 15 minutes and if it has started to turn slightly brown on top, flip them over and continue cooking for another 10 minutes. Check up on the tofu and depending on your oven, if the tofu is still slightly soft and not yet crisp, keep in the oven. If, however, the edges have gone crispy and golden brown, remove from the oven. While tofu is baking prepare peanut sauce and warm tortillas. For peanut sauce put ingredients in pan on stove at medium low heat. Stir together ingredients until fully incorporated. Add more water if you want a more runny sauce or reduce a little to get the sauce more thick. I usually heat tortillas on the stove, but you can use the microwave or throw them in the oven for a few minutes with the tofu. 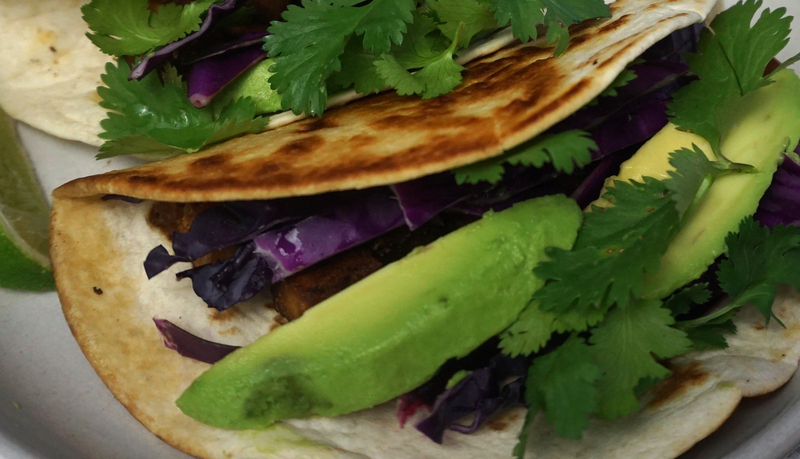 Assemble tortillas with tofu, a couple slices of avocado, cabbage. Garnish with cilantro, green onions, and peanut sauce.